The mission updates for Artemis / Nala1 missions ALS044, ALS045, and ALS046 are long overdue, so here they are! 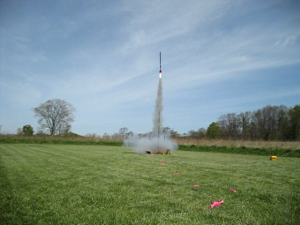 On Saturday, June 9, 2012, Nala1 flew two test flights. The first of which, ALS044 had a good launch. Wind gusts “kicked up” as the launch was in progress, which caused the rocket to experience a bit of a “wiggle” as it left the launch rail. Nala1 recovered nicely, reaching an altitude of 960 feet. The lower altitude was from the shaky launch, which put Nala1 on a trajectory that was less than ideal for maximum height. Nala1 reached a peak speed of 230 MPH. The drogue parachute deployed on the mark, but the secondary deployment charge overpressurized the booster section causing a separation of the booster from the rest of the rocket. The booster fell from roughly 600 feet, and experienced some damage at impact. The rest of the rocket landed safely as the main deployment systems worked without incident. After a repair to the booster lasting about two hours, Nala1 was ready for its next test flight for the day, mission ALS045. ALS045 was a pretty routine launch, successful drogue deployment, but the main parachute was “stuck” in the parachute bay. Nala1 landed under drogue parachute only. There was no damage. On June 10, Nala1 was ready for its last test flight of the weekend. During the flight of mission ALS046, the launch & drogue parachute deployment events were right on the mark. During the main parachute deployment event, there was an over-pressurization of the main parachute baffle, which caused a cascade failure resulting in the separation of the upper section of the rocket from the lower one. Again, no damage as the booster landed under drogue parachute deployment, and the upper section was on the main parachute. After reviewing the data from the last three launches, I’ve made design changes to the upper baffle system to allow for greater variations in the “power” of the deployment charges. This system was ground tested on Saturday (June 23rd) with a much larger than normal ejection charge, and the system passed with flying colors. Nala1’s next mission is tentatively scheduled for July 14th, 2012. Two flights are scheduled, both are designed to test the solutions to the problems experienced off-and-on during her past six missions. More info as we are closer to the date! 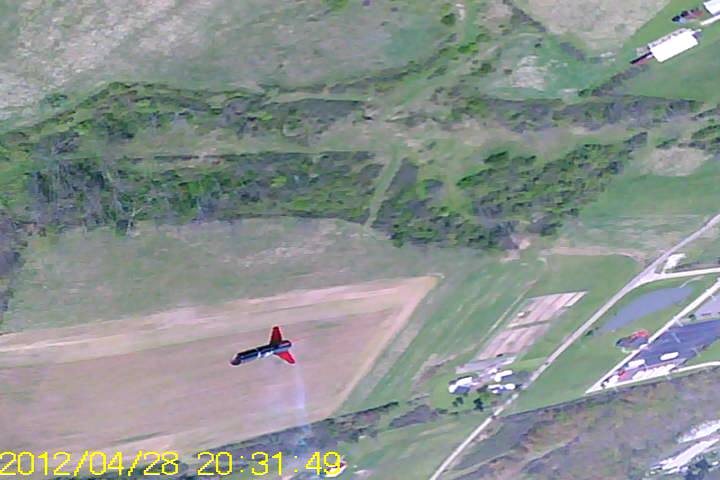 Test flight #2 was as close to textbook as one could get. On mision ALS-043 flown on April 29, 2012, Nala rocket reached the expected height of 1060 Feet (1056, actually), at a peak velocity of 260 MPH. Main and Drogue parachutes deployed successfully, and the recovery harnesses all worked flawlessly. A detailed post-flight inspection revealed damage to an internal baffle for the drogue parachute deployment. A plastic container cap designed to hold the backup deployment charge apparently damaged the baffle. When the backup charge was activated, the cap shot forward with enough force to crush the baffle system. Since the drogue parachute was deployed successfully by the primary system, this damage posed no problems for the mission. A redesign of the baffle has been completed, and installed. June 9, 2012 is the date set for the last of three test flights for X2-06 Artemis / Nala. The goal of test flight #3 is to check the baffle modification, as well as a general checkout for all flight & recovery systems on-board Nala rocket. After this flight there will be a brief pause while X6-01 Nesaru / Adventure is prepared for its maiden voyage. No definite date for launch has been set as of yet, but many of the systems being used on Nala rocket are smaller versions of systems planned for use on board Adventure. Nala’s fourth mission is planned for later this summer on Launch pad #2 where the first of several radio transmitter tests will be performed. The goal is to develop the infrastructure to capture real time flight data from my rockets during flight. The other half of this mission will be the shakedown test for Launch Pad #2, my new high power launch pad. Artemis rocket “Nala1” is a go for its second test flight later today, scheduled for 12 noon at the Harmon Flying field. This test flight is designed to test new systems put into place after last month’s test flight, as well as to further flight test existing systems. Nala1 is the first fully functional rocket featuring full computer controlled flight systems, and experimental payload capabilities. After this flight, one more test flight is scheduled. The exact agenda for the third mission is to be determined based on the outcome of today’s mission. Assuming a successful flight, the third flight may entail pushing the envelope farther, sending Nala1 higher than any of my other rockets have routinely flown with exception to Perseus/Eagle. Eagle reached an estimated altitude of around 1750 feet on January 2011. The first high-altitude flight for Nala1 will be an attempt to make at least 1850 feet. To shoot for thsi kind of altitude @ Harmon Field will require perfect weather conditions, though. So far, the plan is to go for this altitude, if not to “go for broke”, and shoot for a 1/2 mile altitude attempt during GLRMR XII @ the Skybuster’s Amherst field this coming May 5th. Today’s flight altitude will be for a little over 1,000 feet. Details to come later today!